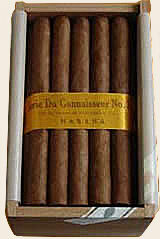 We guaranty authentic cuban Serie Du Connoisseur No.3 cigars. The Partagas Serie du Connoisseur No.3 is a refreshing cigar and is not aggressive at all. It has the same characteristics as the Partagas Charlotte but with less power.